The Simple Portfolio premium theme is the ultimate solution for a powerful, yet minimal portfolio based WordPress template. Simple Portfolio theme is designed with an unobtrusive, minimal approach that focuses the viewers’ attention to the artwork displayed on the site. Simple Portfolio displays imagery and text beautifully in a clean layout. Portfolios are manged as categories and can be displayed in a 1, 2, or 3 column layout. 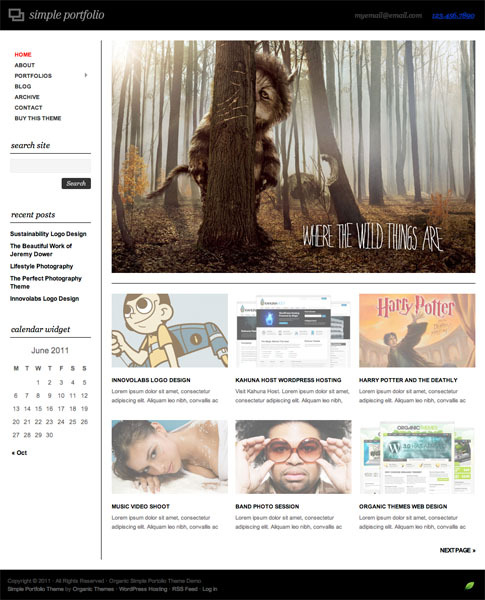 The theme utilizes custom post types to manage featured slides and blog entries, while all portfolio content is added using traditional WordPress posts. Creating a beautifully simple and professional portfolio site has never been easier than with the Simple Portfolio premium WordPress theme — check it out towards the end of this post! Check your Text Link Ad Affiliate Stats!